RMS Skip Hire is one of the most prominent waste management and skip hire firms in Orpington. Known for offering end-to-end waste management solutions and extremely efficient skip hire services, we have managed to build a highly sought after reputation in the skip hire industry over the years. Since happy customers are our biggest strength, we fully believe in going the extra mile to fulfil their skip hire and waste management needs. Our accomplished skip hire and waste management team not only focus on satisfying your current needs, but they also concentrate on building a never-ending relationship by offering the best and most reliable solutions to you. We make tremendous efforts towards eliminating your skip hire doubts and confusions by giving detailed information on different types of skips that we offer and their prices. We also help you in picking the correct skip for residential, commercial, and industrial projects. We provide both skip hire services and waste management solutions for individuals and businesses in Orpington. We are very particular about sticking to deadlines, so we never fail to deliver your skips at the right time. It means if you pick us as your skip hire and waste management partner, you will never have to deal with delivery delays. Our skips are of very high quality. You can load the waste generated from your project, and we will collect according to your convenience. If you require the skips on the same day then you can rely on us. We will deliver your equipment quickly so that you can finish your project fast. If needed, we will also manage a skip hire permit for you, so that you can use the public road or land to store the skips. 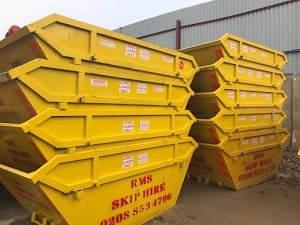 So, if you are searching for a trusted skip hire and waste management firm in Orpington, Please call RMS Skip Hire today.